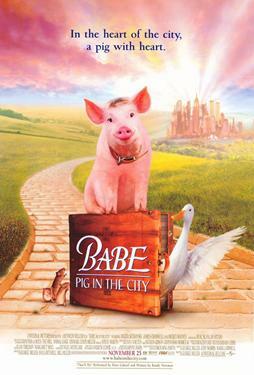 Returning to the farm after winning the Sheep Dog competition, Babe, the Gallant Pig, must venture to the big city when the Hoggett farm faces foreclosure. With Farmer Hoggett unable to work after an accident, and creditors at the door, Mrs Hoggett is offered much-needed money to take Babe to a far-off fair. But when they arrive in the big city, a mixture of New York, LA, Paris and the fictional Metropolis, they are faced with an urban nightmare. After having their bags stolen, Babe ventures out to save not only the Hoggetts' bacon, but that of the city's animal population as well.